Northern red salamander (Pseudotriton ruber ruber); official state amphibian of West Virginia. Photo by Andrew Hoffman/Flickr (Noncommercial Use Permitted with Attribution/No Derivative Works). The Romney Middle School eighth grade "West Virginia Studies" class introduced the idea to the House of Delegates, proposing that the northern red salamander's color pattern showcases the autumn colors of West Virginia with red representing the fall foliage of sugar maple trees and the peppering of black spots representing the coal mines that dot the region. 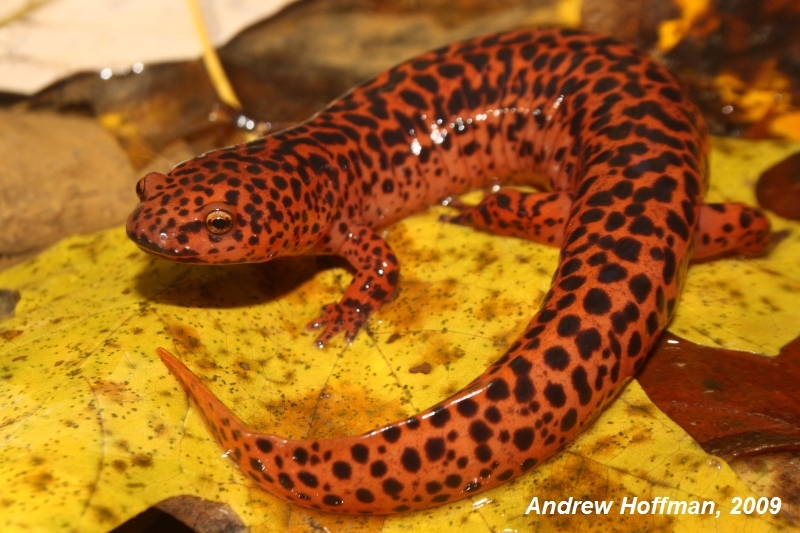 They also suggested that the salamander's five toes on each back foot and four toes on each of its front feet represent the 55 counties and eight major rivers of West Virginia.